Firstly MERRY CHRISTMAS EVE everyone! 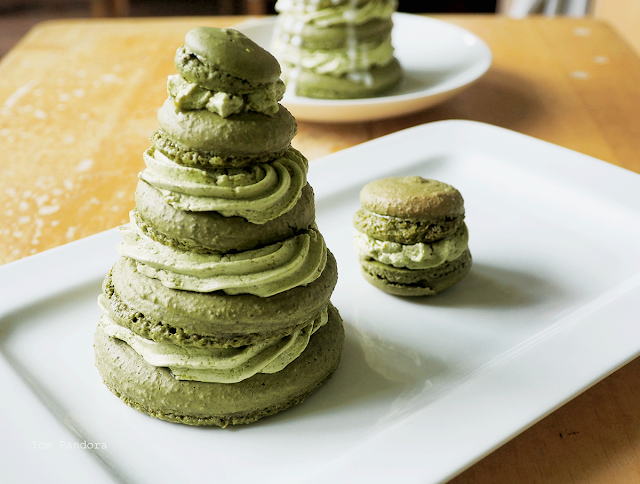 I feel like I'm slacking and delaying with blogging because like todays post about making a Christmas tree with French macarons suppose to be out a couple days/a week ago. 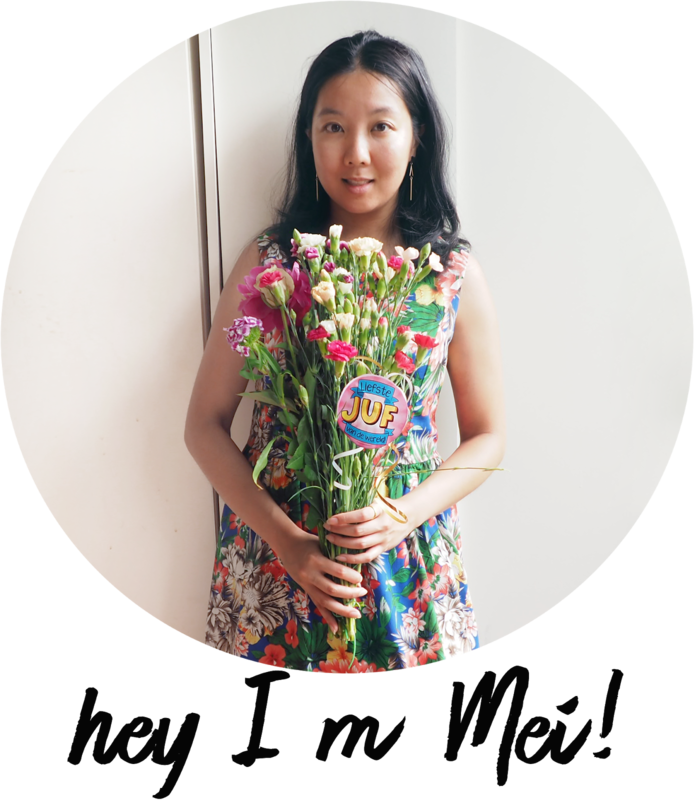 I'm amazingly sorry! It's a good thing that my Winter break has started now and I'm off for 2 weeks! Woo! 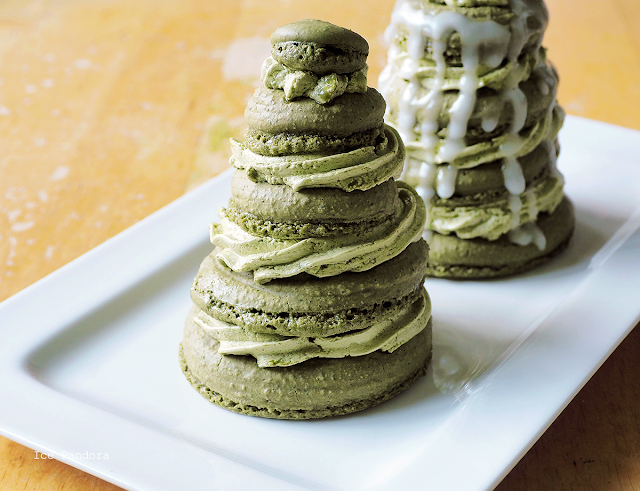 Anyway, tomorrow is another Christmas day and if you still need to spice your Christmas up, here's a little last minute dessert/decoration for you: a Christmas tree made of green tea flavored French macarons! Enjoy! Allereerst: een héél fijne feestdagen gewenst aan jullie! Ik loop een beetje achter met mijn blogschema want de blogpost van vandaag over `t maken van een kerstboom van Franse macarons zou eigenlijk dagen/een week geleden gepost hadden moeten worden. Zucht. Sorry! Gelukkig heb ik nu lekker 2 weken kerstvakantie en hopelijk kan ik weer op adem komen en gelukkig hebben wij 2 officiële kerstdagen dus mocht je nog een last minute kerstidee nodig hebben, maak dan dit leuke kerstboom gemaakt van Franse macrons in de smaken groene thee! Geniet ervan allemaal! Draw circles on the baking paper for better dimensions. I`ve used different kind of pots and cups for the measurement. Don`t forget to flip the baking paper once you are done drawing! We don`t want to taste any markers in our food right? A tip! Smooth it out by gently tapping the tip away with your finger. This is my favorite buttercream at the moment but you can use whatever buttercream or filling you like really. 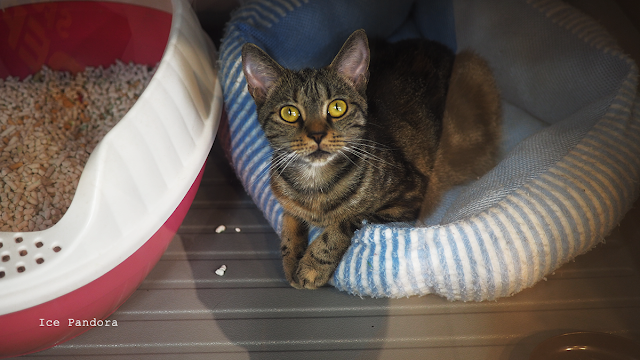 Already looking pretty cute and awesome here but we`re going to make it extra merry of course! 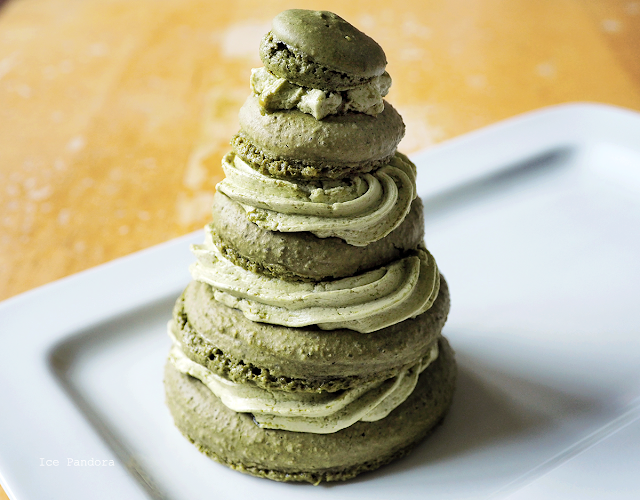 The icing on the cake macaron. Too cute to eat right? 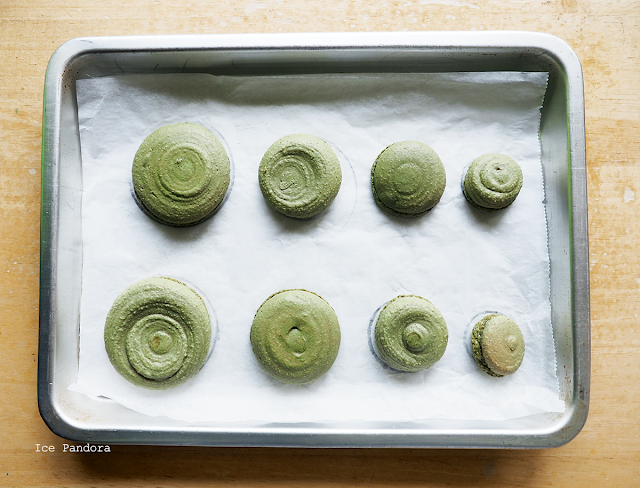 You can store it in the fridge in a container to remain fresh and crispy. Happy holidays everyone! 1. Get a baking tray and line it with baking paper. 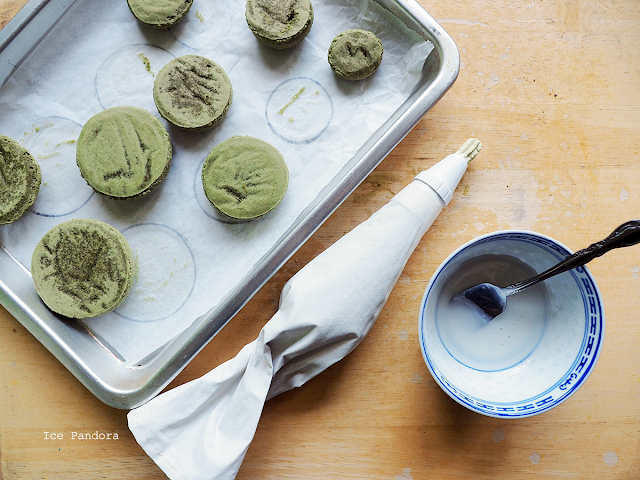 Sieve the almond flour, icing sugar and the matcha green tea powder 2-3 times and set a side. 2. Beat the egg whites in a large clean bowl on medium speed and once there are foam forming add the sugar gradually. Stop beating the egg white when it reached high peak and stiff. 3. 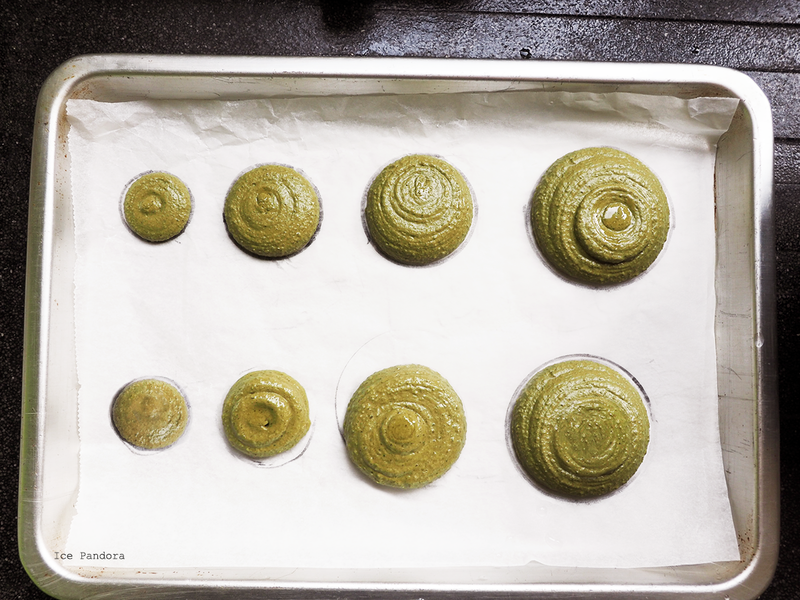 Add ⅟₃ of the sieved almond flour mixture into the egg white and fold gently. Once the almond mixture is well combined add the next ⅟₃ of the almond flour mixture and repeat this whole process. 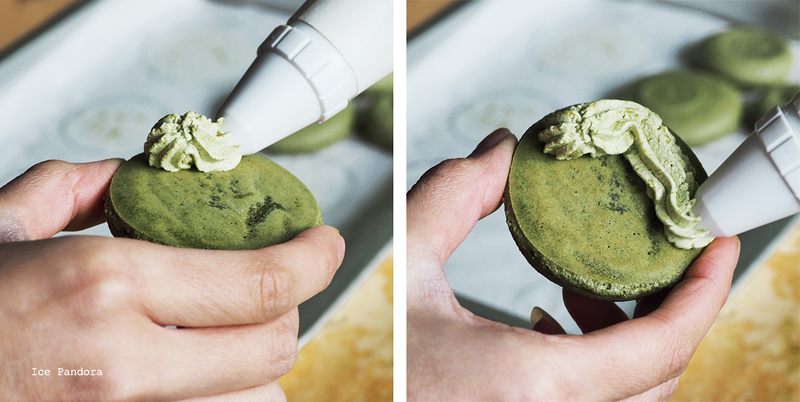 The batter of the texture should be thick but still able to drip off your spatula. 4. 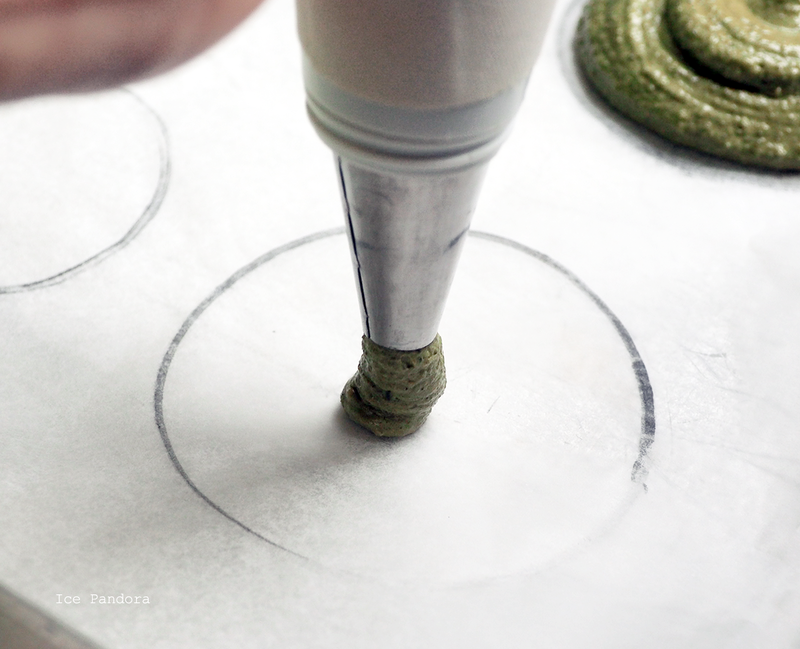 Fill the piping bag with a round nozzle with the batter and pipe circles on the prepared lined baking tray. Once everything is piped tap the baking tray on a surface to release air bubbles inside the macarons. 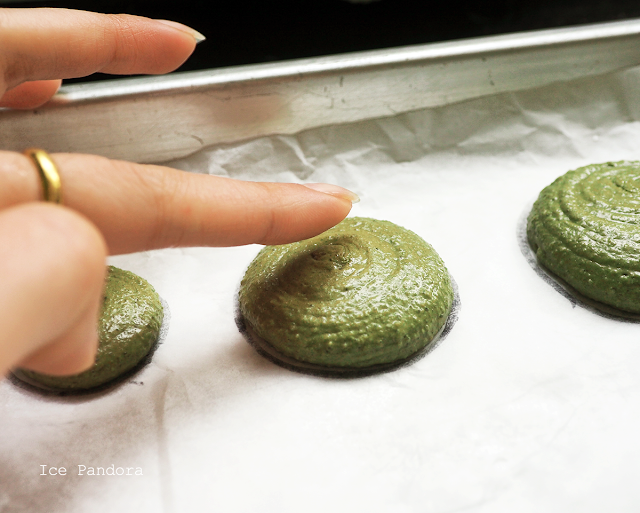 Let it rest for 30 minutes before baking. Meanwhile pre-heat the oven to 130°C. 5. Lower the temperature to 100°C and bake the macarons for 20 minutes. 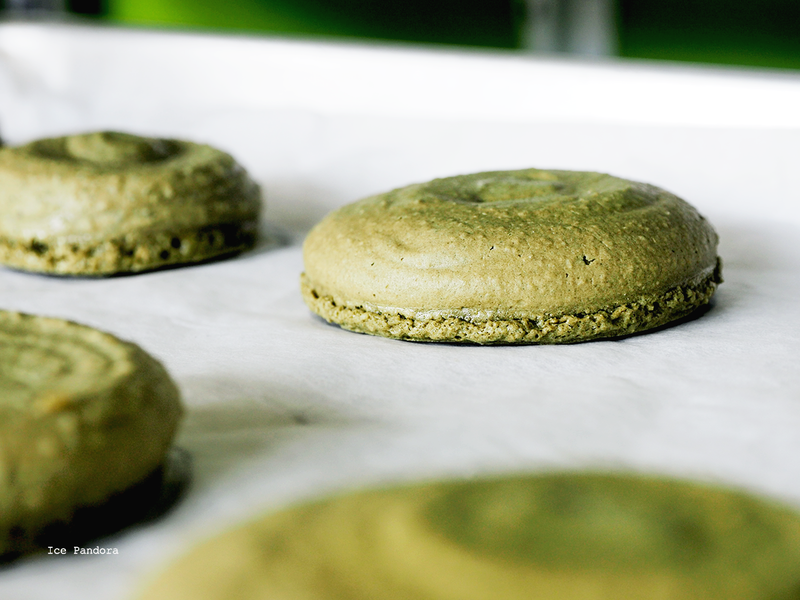 I`ve noticed that the baking process can be different because of how different each ovens works so keep an eye on the macarons. 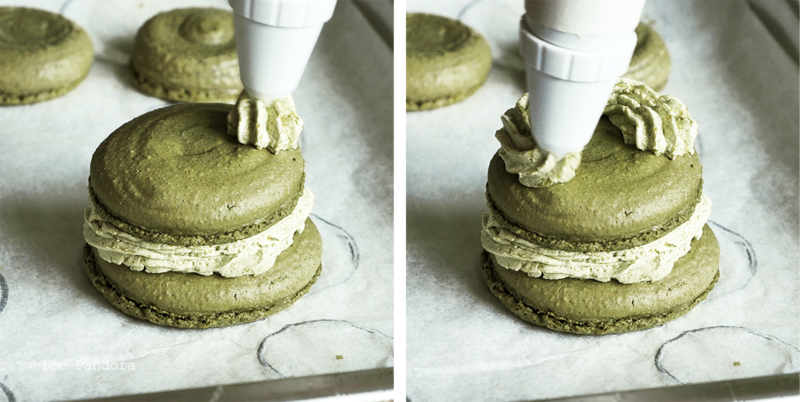 Also check if the macarons are baked through, you can check it out of how easy the macarons lift up without sticking. 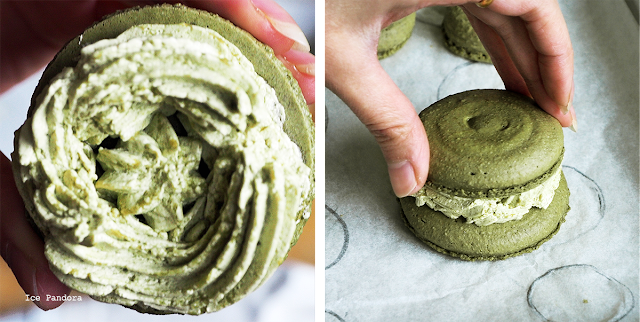 If it sticks/has wet bottom bake the macarons at 100°C for 2-3 minutes. 1. 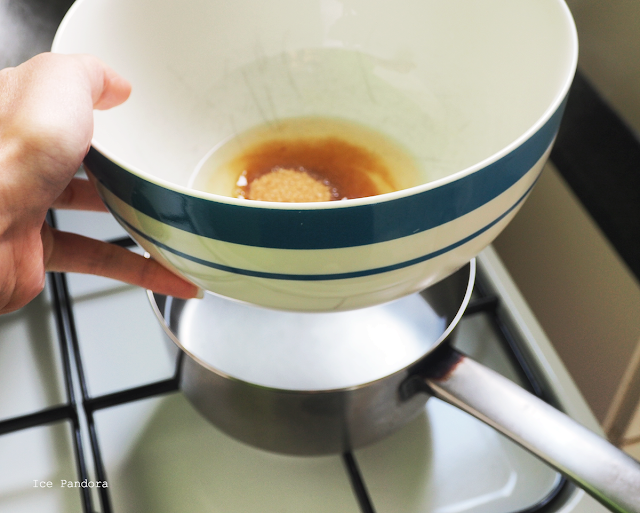 Prepare boiled up water in a pan on low fire and on top goes a heatproof bowl (caution: do not let the water touch the bowl!). Add the egg white with the sugar into the bowl and beat until high peak, when it reaches around 50°C (or when it feels to hot for your skin to touch) and all sugar has dissolved. 2. Remove the bowl from the pan and transfer on a cool work surface. Add the butter gradually. You might notice that the mixture is about to curdle up. Do not panic! 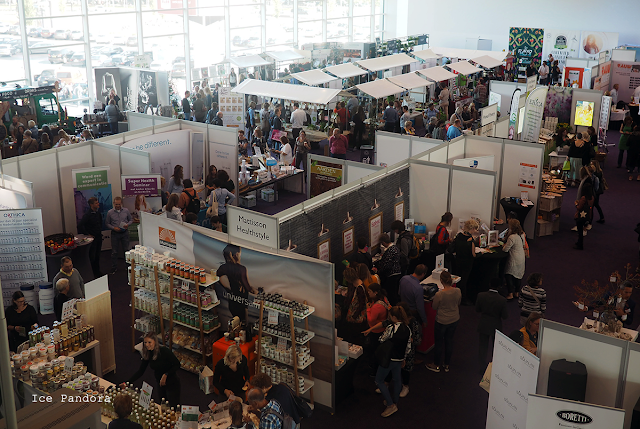 Just keep continue beating and you`ll see that everything will be mixed and combined together into a smooth, airy and velvety texture. Let it cool down and set aside. 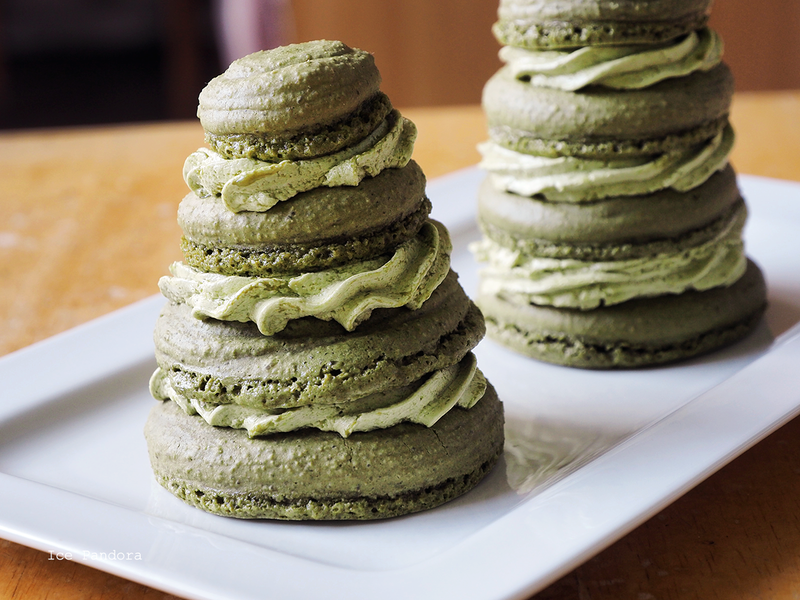 Congratulations you`ve made the simple version of Swiss buttercream! 3. Spoon the buttercream filling in a piping bag with any desired nozzles (I`ve used a star tip) and let it set and rest in the fridge for 30 min. 1. 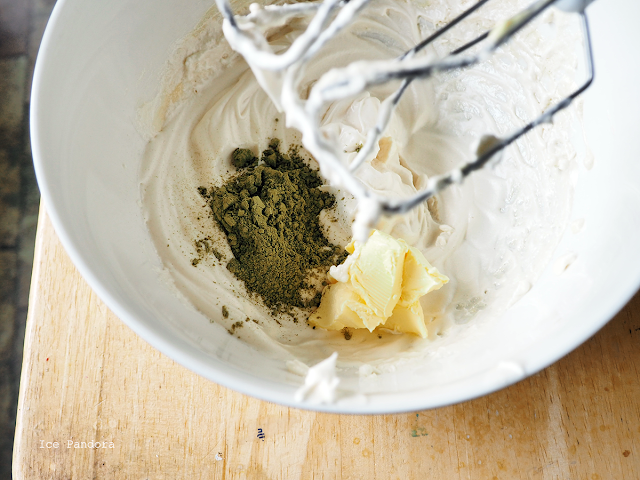 Combine with a spoon all ingredients together in a bowl and set aside. 1. Place the biggest macaron cookie at the bottom and pipe the Swiss buttercream in a circle on top of it. 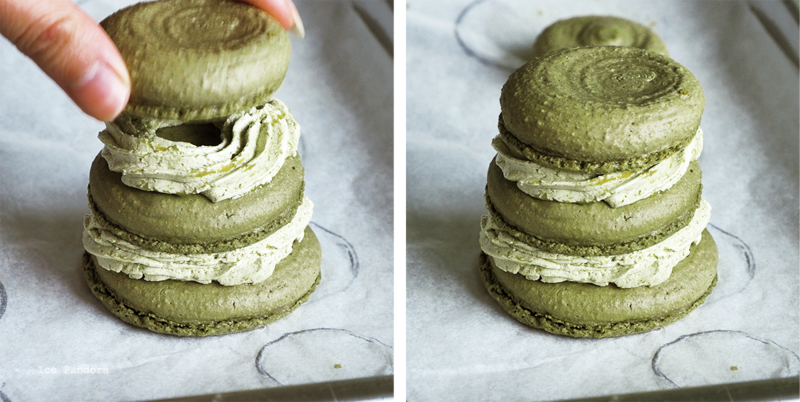 Then place the second biggest macaron cookie on top of it. Pipe another new layer of buttercream on top of this one and place the next macaron cookie. 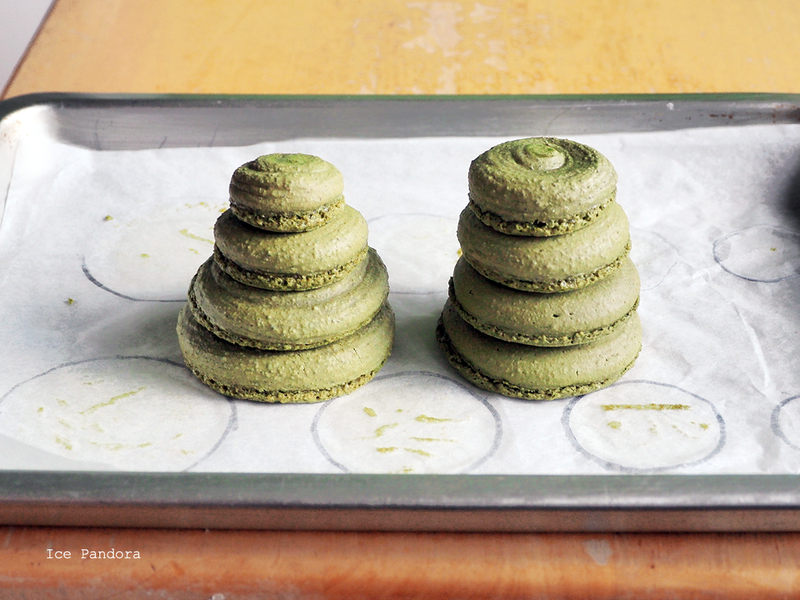 Repeat this build up steps until the last (smallest) macaron. There, you`re done! 1. For extra Christmas effect you may want to add snow glaze. 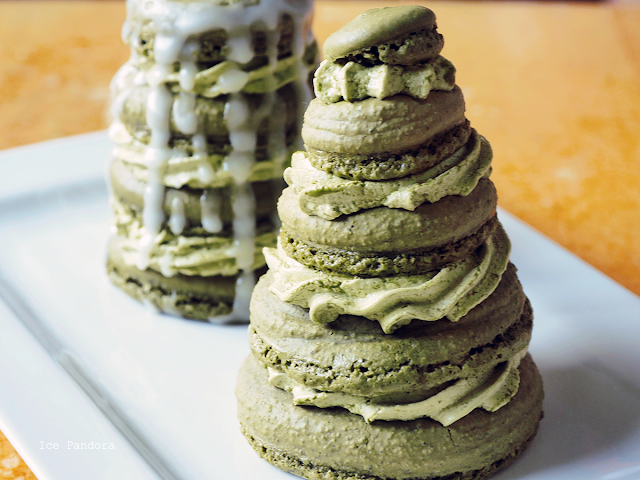 Just drizzle and drip from the top and side the prepared glaze on the French macaron Christmas tree. 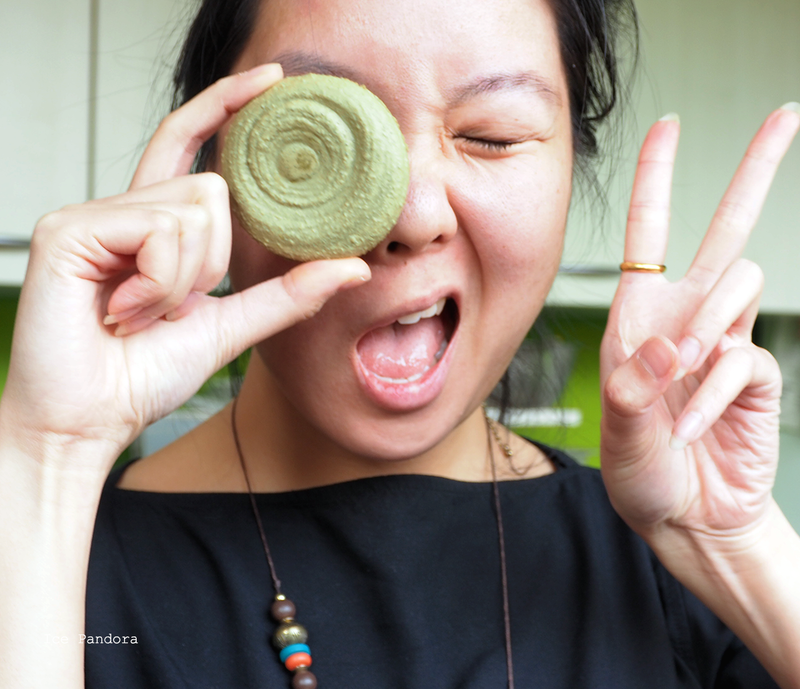 This look so delicious and fun! 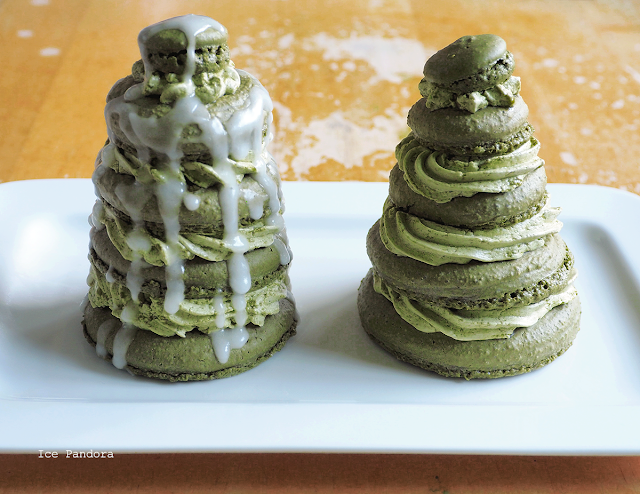 I had a matcha latte recently and I was like "where have I been??" 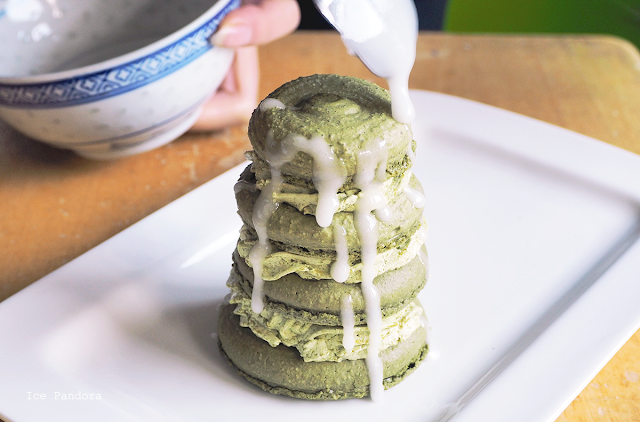 I need more matcha in my life right now! I adore this!!! It's beautiful and so creative.